An interesting part of the world – for sure! So there’s literally no safe way through to S. America? I must say, sailing that region of the world does sound like fun. What an adventure! Was it hard to part with Marlin? That sailing sounds amazing. Enjoy! We just arrived in Cartagena, having had to extend our sail ing time due do some rough weather – my romantic notions of sailing round the wolrd have been put into persperctive a little. Yes it was a little scary leaving little Marlin locked in that huge Canal port, I hope we see him again. hey Stefan – the sailing was really fun, but the trade winds favor sailing in the opposite direction so after we left the San Blas Islands it was fairly hard going for a couple of days. 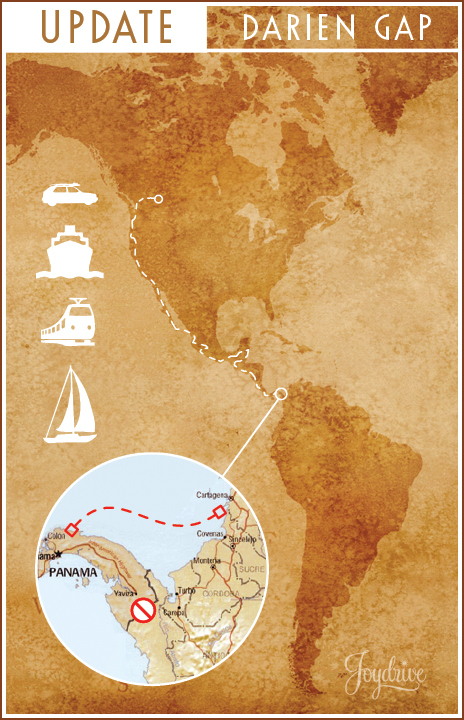 We´ll get a post up on the sail once we´ve found our bearings and our car! you can drive through like they did in the more the art of backpacking….just make sure u can cite ur communist guerrillas!